Well, last card before Christmas for me. I guess I have to apologize once again for not being around to visit your lovely blogs. I had to take some unscheduled time off, so this is a scheduled post, but I will be back after Christmas and I will catch up with everyone then. 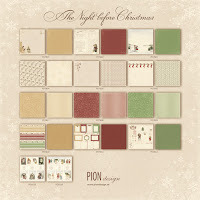 One last Christmas card using Pion Design "The Night Before Christmas" collection. I will be sad to pack this paper away!! I really wanted to take some pics that were Christmassy for this post, but I didn't have time before I left, so I hope you will enjoy some snowy photos instead. For my landscape shot, this Christmas tree in the middle of nowhere! 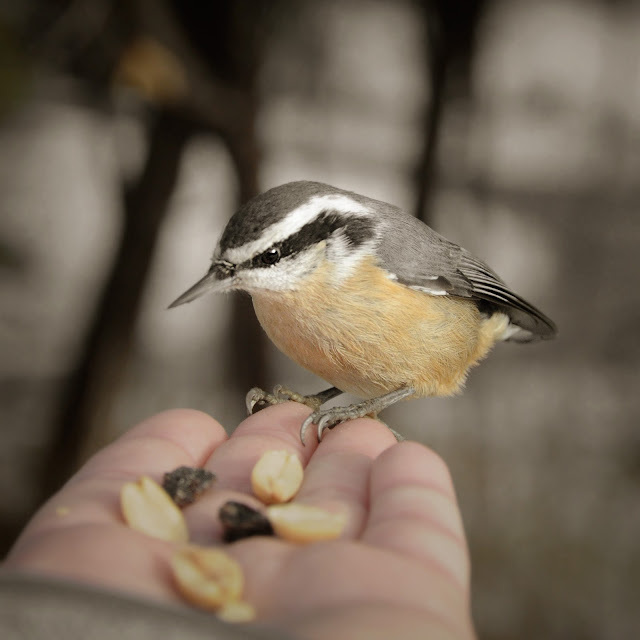 For my bird shots today, a Starling, a female Cardinal, a Blue Jay and a Red Breasted Nuthatch eating out of my hand. 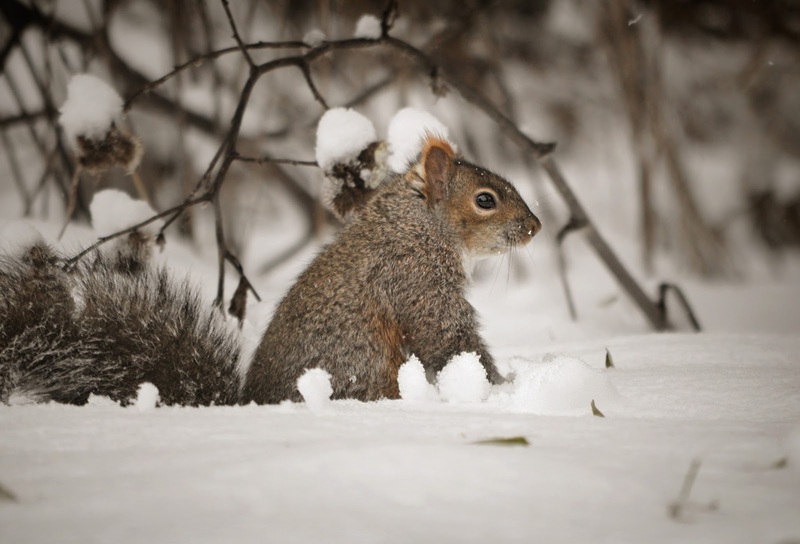 "If I just keep hopping, than maybe my feet won't get too cold!" "I am waaaay too tiny for this crap!" "OK, I'm coming all the way over to you. You better make it worth my while!" "Oh, I'm so excited to finally meet you! I traveled for yards and yards to meet the peanut lady!" 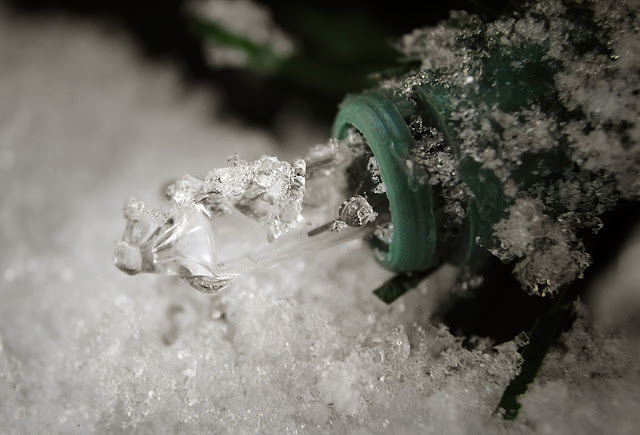 My macro for today is this Christmas light covered in ice. Unfortunately my outdoor tree burned out, so the light is not lit. Oh well, next year! For Christmas this year, all I ask for, is that you keep this quote and photo in mind, as you stay snug and warm in your houses and feast on turkey and eggnog. "Humans are not the only animals trying to survive each day." I enjoy reading your blog - you are such a kind person to help our animal friends! Thank you for all your wonderful cards and photos that you share. Just popping in to wish you and your family a very Happy Christmas. Will see you again after the festive season. 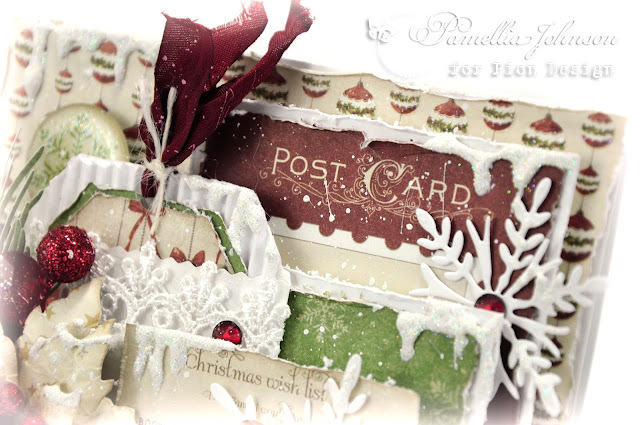 A stunning card Pamellia and amazing snow scenes for us to enjoy. 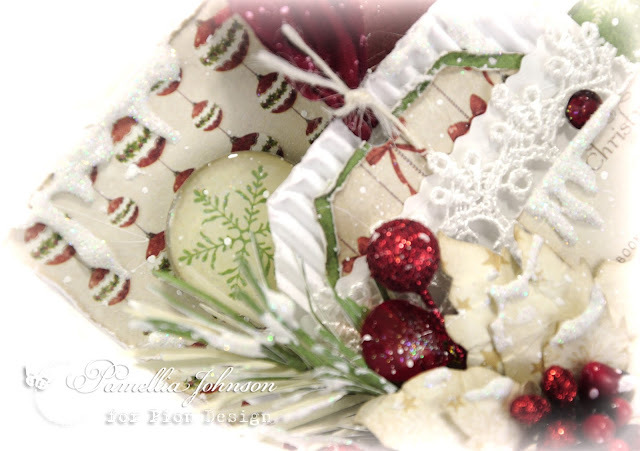 Stunning creations Pamellia, beautiful photos as always, I do love hearing about your little friends, so gorgeous. You are so lucky to have gained their trust. Have a most wonderful Christmas and New Year hun, we are off to my daughters in Cornwall tomorrow. In your hands those papers are exquisite Pamellia, you really have shown them off so beautifully and this card is stunning too. The rich, vibrant red embellishments are gorgeous. 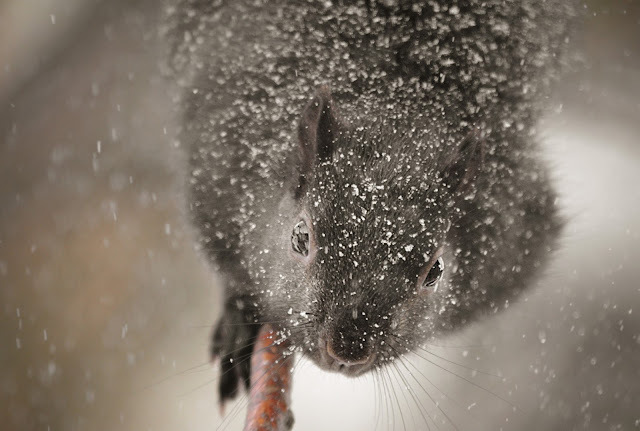 The Christmas tree is certainly very impressive with its boughs laden with snow... the birds are so pretty and I love the way the squirrels fluff their fur up against the cold..
What an amazing card, Pamellia. Don't know how many times or ways I can say beautiful card as they always are lol! Wishing you, Mr J and your furry and feathered family a peaceful and joyful Christmas and every happiness for 2017. Hello there Pamellia, my, oh my how gorgeous, more beautiful layers and embellishments. The papers is stunning. More wonderful photos, just love them. I have enjoyed your blog each week for the past year with all you superb projects. looking forward to your work next year. Your photos have been wonderful and you now have a little family of furry friends. Have a wonderful Christmas and best wishes for 2017. I'm so happy to have found you, "peanuts lady" :D I always really enjoy look at your sweet and strong friends, reading your posts and admiring your amazing creations!! 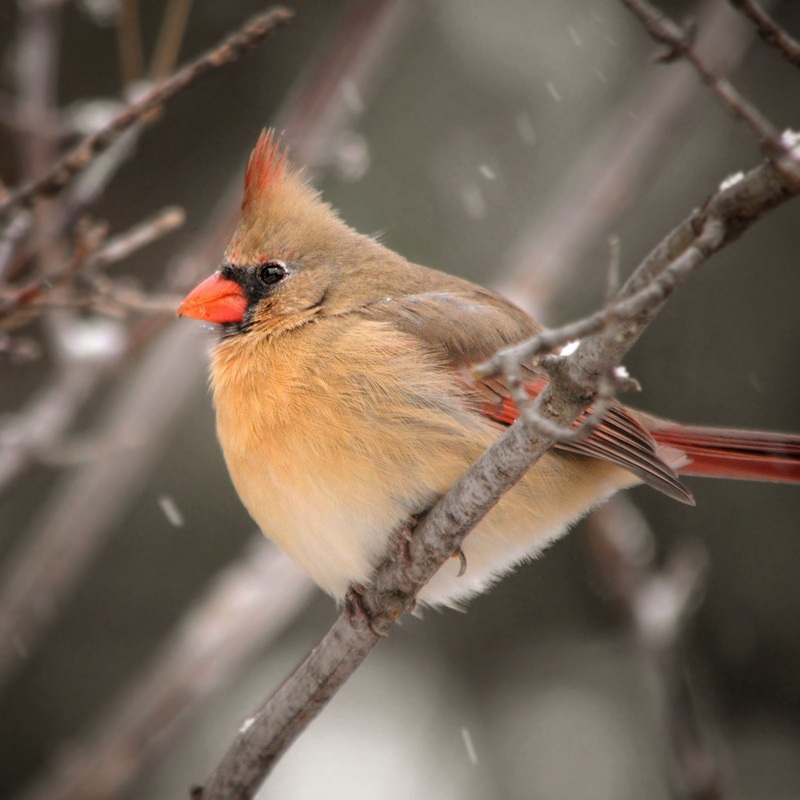 Thanks for this year of art and wildlife! I waiting for the new year posts! Your photos make always my days :) I agree with your quote, and always think to the little furry and feathers lives. I wish you a very Happy Christmas and a Happy New Year! 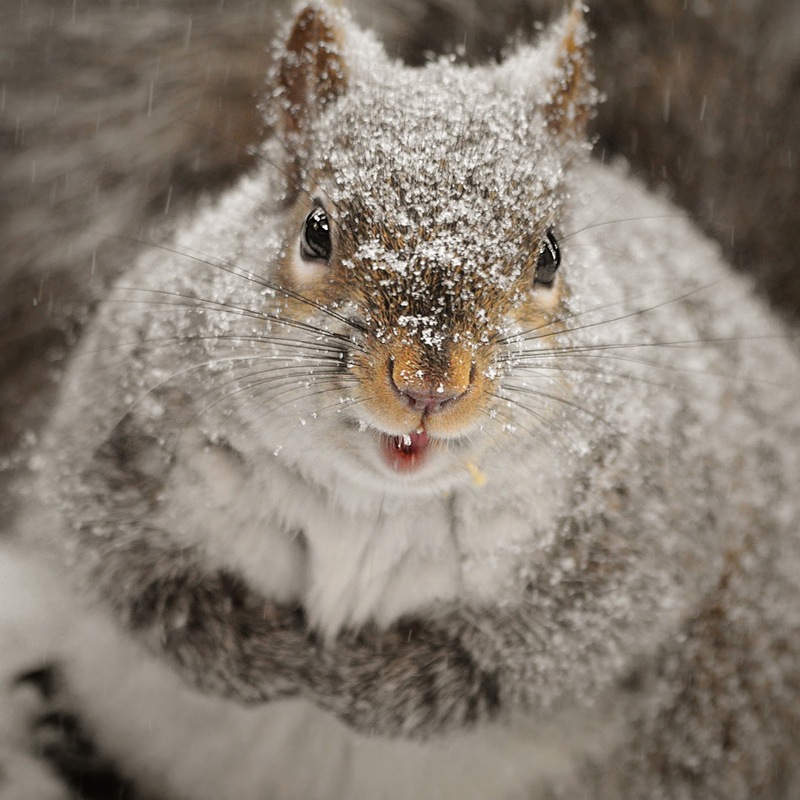 And I wish to all your dear friends a not too difficult winter time, and some peanuts any day. Stay all you more warm as you can. 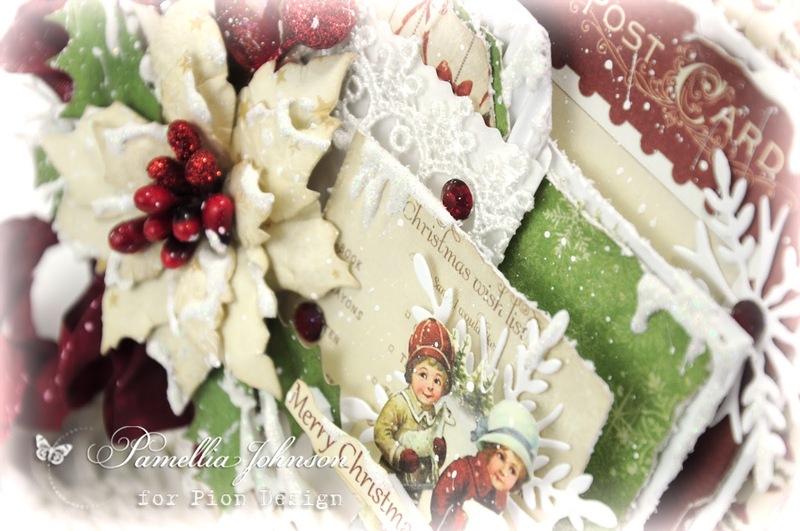 A beautiful Christmas card Pamellia and as always I look forward to seeing your wonderful photos that you share with us. Hope you have a lovely Christmas and a very Happy New Year. Very nice work with this Pion Design Collection! I have only been viewing your designs a short time but have enjoyed it. Looking forward to seeing what you do next year. 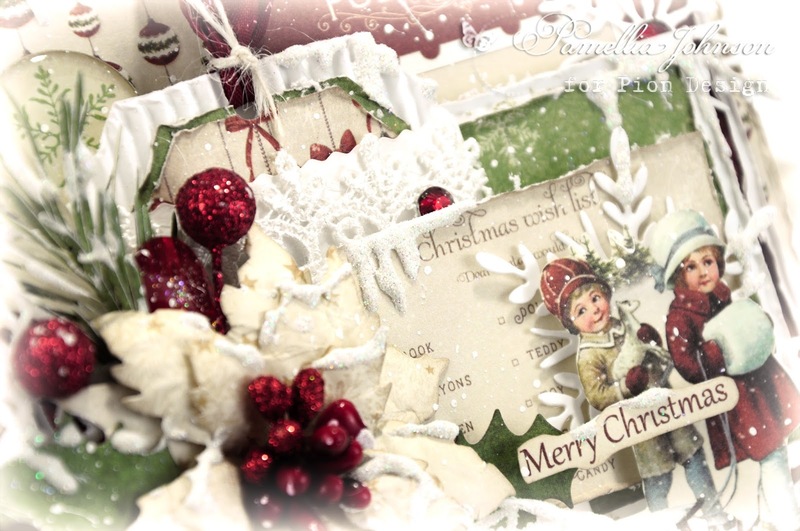 Absolutely gorgeous Christmas card Pamellia! Love the rustic feel and such gorgeous warm colors. You really show how to use these papers to perfection Pamellia!! Another super gorgeous card! So much to discover and loving all the details! Once again, your photos are brilliant! So heartwarming seeing all your little friends and knowing they have someone who cares about them. They are so lucky to have you! Another beauty Pamellia - I do hope you and your family are all well. Thank you for another year of inspiration, both from your cards and your photography and your love of little creatures. Pamellia, again I am amazed at your ability to make these already beautiful papers and make them into something so beautiful that I can no longer find adjectives to describe them! 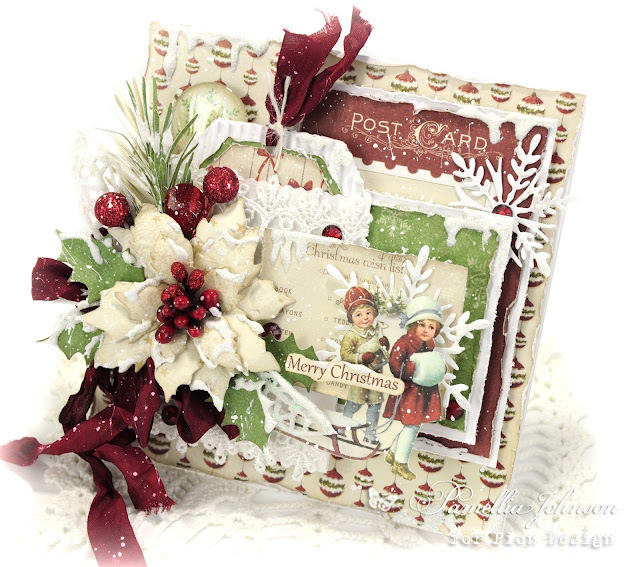 I'm just smitten with the snowy and corrugated layers, the gorgeous colors and your festive embellishments and laces! I truly could sit and stare all day! Your wildlife shots are amazing, and of course, I love the words you have put in their mouths! Thank you for taking care of these creatures; your heart is big and caring! Merry Christmas to you, and thank you for your many blessings this year! Sending hugs! Another absolute stunner from you, Pamellia! What you do with those amazing Pion papers is simply magical! I am drooling over this perfection! 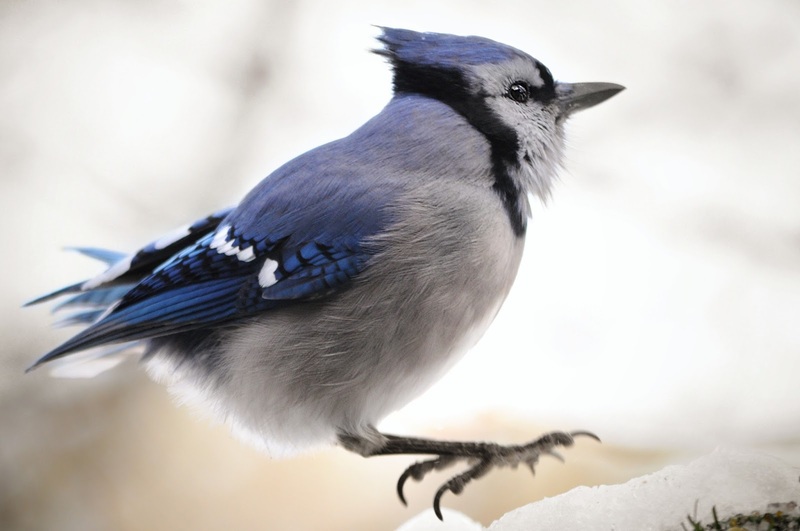 Thanks so much for another fantastic set of wildlife shots! I can't find the words to descripe how much I love them! I totally agree with the quote! 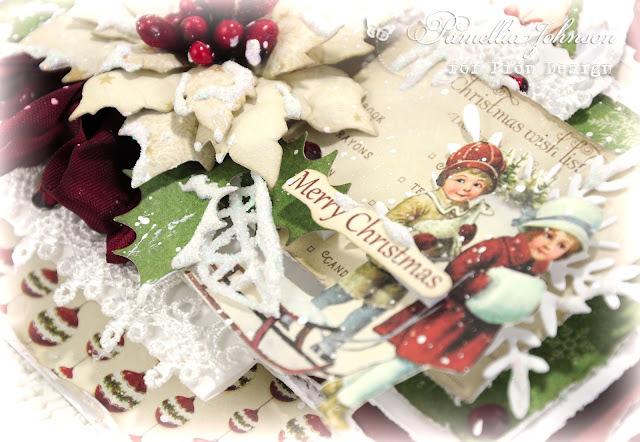 Another stunning card Pamellia and wonderful photos..Wishing you and your family a very Merry Christmas and a Happy, safe and healthy New Year 2017.. I will be sad to see you pack those papers away too, you have really surpassed everything with these papers and I LOVE LOVE LOVE what you have done with this card. 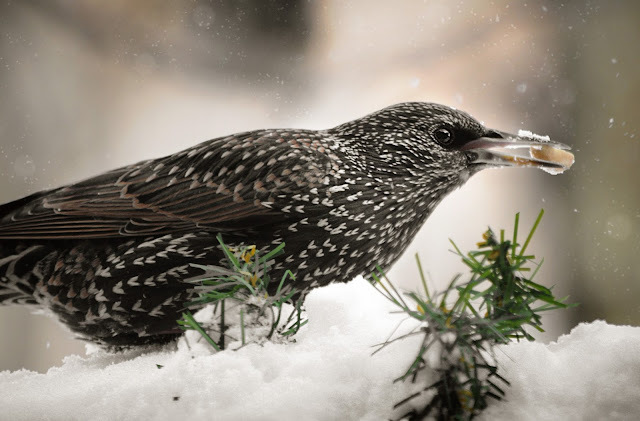 Your photos are just beautiful and I hadn't realised that the starling looks like he has a knitted jumper on. Happy Christmas my friend, I hope your Christmas and New Year is as Wonderful and Beautiful as the joy you give me on each visit. Gorgeous post...art and photos! LOVE what you've made just stunning! Merry Christmas to you and yours! Wonderful card! All the layers are lovely! I hope all is well with you. Wish you and yours a very Merry Christmas! Stunning card Pamellia and lovely winter photos. Merry Christmas and Best Wishes for 2017. Adorably Beautiful Card - just precious. 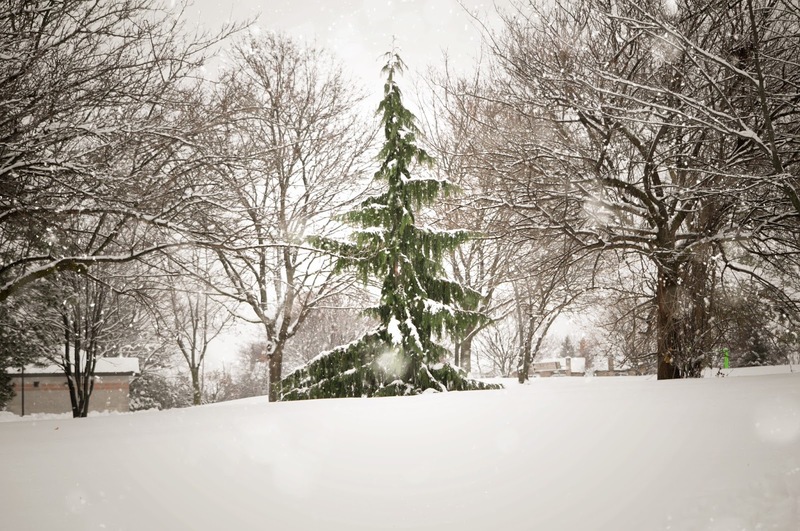 And I totally love the photo of the Christmas Tree in the middle of no where. It's perfect. 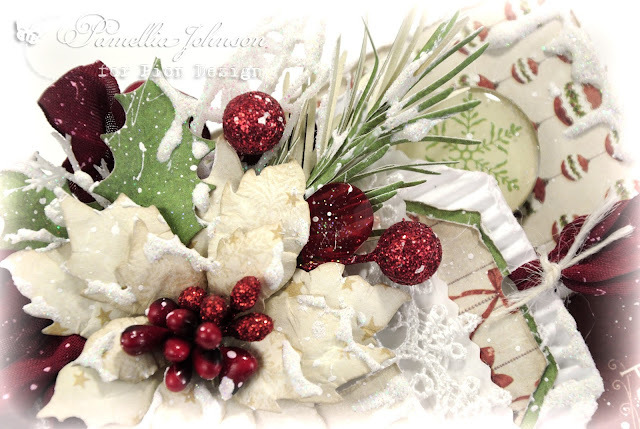 Fabulous card and photos, and I've just been enjoying your beautiful creation over at Pion too. Hope you are enjoying a lovely Christmas. Another beautiful card. I'm contemplating continuing with my Christmas paper a little longer. I'm just not ready to put them away. But if I put them away now, it will be so much fun to rediscover them next year. I'm am ready to get out my art journal and do a little organic creating hurt for me. Enjoy your break. My absence was very unscheduled but I'm glad to be back and visiting you. 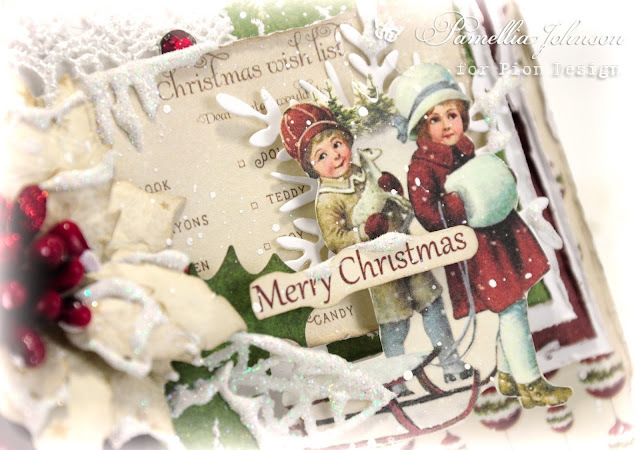 Stunning card, the epitome of Christmas and your photos take my breath away! I just adore them! Just popped in to wish you and yours a peaceful 2017. May it bring you light and joy and creativity. Oooh Pamellia... This blog post, your card, and all your pics I know well and love through IG, are just SO exquisite and delightful. SO beautiful too... And your words sound so right. Time for me to pop in here too (and subscribe to your blog by some way, even if I can' leave you a comment at every post, sorry in advance but I'm just too crazy busy some days!) to wish you and yours, a peaceful, beautiful, joyous, creative (but no worries about that lol) and healthy year.All the best for you in 2017 my friend!!! What a stunning card, beautiful design, I love all of the layers and the beautiful traditional colours - just look at all of those gorgeous berries. 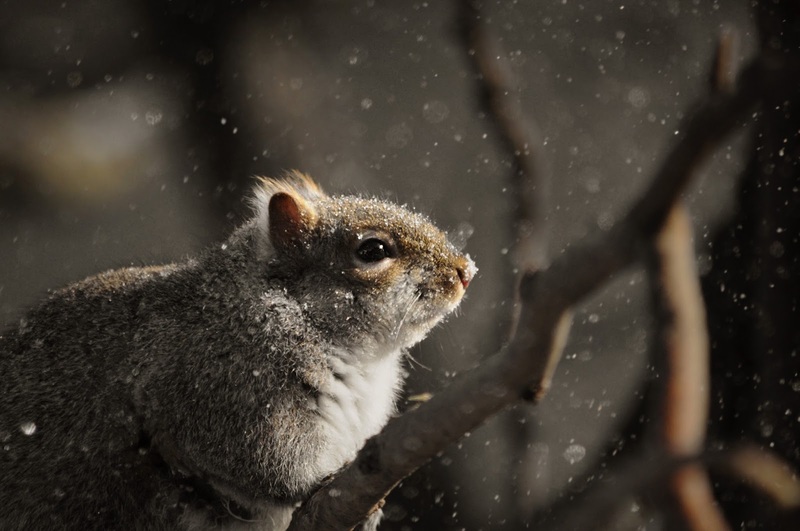 Truely wonderful wildlife shots, all of the birds look amazing and the lovely squirrels in the snow. You are truely inspirational. Thank you for another year of wonderful projects and hints and tips - as well as your amazing photography and opening our minds to the plight of our wildlife.